You only want the best for your baby, and so do we. 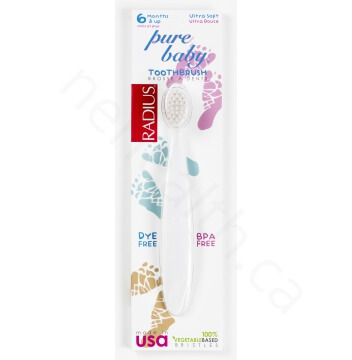 As sensitive as it is effective, the Radius Toothbrush 6mon+ is exactly that — free of BPA, dyes, and harmful chemicals. Designed for the delicate teeth and gums of 6–18 month olds, it softly massages the whole mouth as it works to remove plaque buildup on your little one’s tiny teeth. Genlty brush your teeth twice a day for a minimum of two minutes.